A number of crustose, calcareous red algae (Corallinaceae) grow detached in shallow waters and accumulate to form large beds of stone-like algae on the coasts of north western Europe and in the western Mediterranean, México (Baja California), and Brazil. 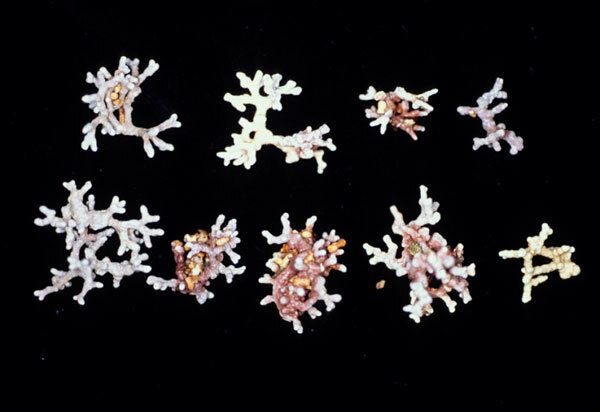 These are collectively known as "maërl", "coral" or "coral sand" in north-western France, Britain and Ireland (Blunden, Binns & Perks 1975). Scientifically, they are also know as "rhodoliths". Some have rocks or stones at their centers, other do not. The two most common species in the north-eastern Atlantic are Phymatolithon calcareum and Lithothamnion corallioides, growing from 0-8 m (occasionally to 32 m) in the subtidal of quiet bays with clear Atlantic water off the coasts of Spain, France, England, Scotland, and Ireland, and in the Mediterranean. Similar species form such beds in clear waters throughout the world, such as the Gulf of Mexico, Arctic Canada, Indonesia. The algal thallus is made up of successive layers of calcium (and some magnesium) carbonates, which may account for up to 80% of the wet weight. Maërl is dredged off the coast of Brittany, at Falmouth in England, in Bantry Bay, Ireland, and in Iceland, dried, ground, and sold as a soil additive, for animal feed supplements, as a water filtration agent, and as a natural anti-osteoporosis remedy. Over 500,000 t are harvested each year from live and dead deposits, although annual amounts are declining, mainly due to the exhaustion of resources, particularly in France. Transport and drying costs are high and the main advantage over ordinary lime may be the relatively large amounts of trace elements present in the seaweed product. This product is much favoured by organic farmers and horticulturists as it is believed to provide many trace elements that might otherwise need to be added in "chemical" form. Ground maërl is particularly good for water filtration. In Ireland, about 20,000 tonnes of subfossil maërl is harvested from a site in Bantry Bay by Celtic Sea Minerals. 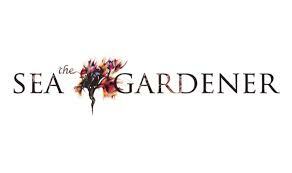 The company specialises in the development, manufacture and marketing of natural products. This reliable source of natural products is marketed and sold by a worldwide network of distributors into the animal feed industry, animal hygiene and environmental markets. G. Blunden (1991). Agricultural uses of seaweeds and seaweed extracts. In Guiry, M. D. & Blunden, G. Seaweed Resources in Europe: Uses and Potential.. John Wiley & Sons, Chichester, 65-81. G. Blunden, W.W. Binns & F. Perks (1975). 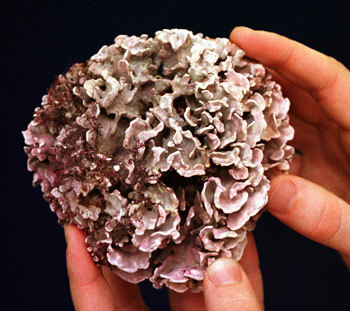 Commercial collection and utilisation of maerl. Econ. Bot. 29:140-145. Site © M.D. Guiry 2000 - 2019. Important copyright notice: all text, design and photographs on this site are copyrighted by M.D. Guiry unless otherwise stated and all rights are strictly reserved. Click here for copyright information and contact. Website design: 249 Design Studio. Site maintained by M.D. Guiry (michael.guiry@nuigalway.ie). There have been 8724595 page loads since 1 January 2014 on 22 April 2019.